The majority of people will experience arthritis pain at some point in their lives — even before becoming a senior! Arthritis is inflammation within the joints. Each year, an estimated 54.4 million U.S. adults are told by a doctor that they have some form of arthritis, according to the Centers for Disease Control and Prevention (CDC). To put a futuristic perspective on it, by 2040, an estimated 78 million American adults ages 18 years or older are projected to have doctor-diagnosed arthritis. No matter what age you are, arthritis prevention should be a priority and taken seriously. The early warning signs of arthritis are fatigue, joint stiffness, minor joint pain, fever, a decrease in range of motion, numbness and tingling. Once arthritis manifests in your body, you’ll experience flare-ups of pain caused by joint stiffness, which typically get worse the older you get. The most common types of arthritis are osteoarthritis and rheumatoid arthritis. If you’ve already experienced signs, don’t be fooled if your aches and pains subside for awhile; arthritis is accompanied with inactive periods, called remission. The foods you eat play a major role in how severely arthritis can affect your body. “Research is ongoing, but scientists already have found that certain foods may reduce arthritis-related inflammation and pain,” according to Dr. Andrea Dunn, a registered dietitian and certified diabetes educator in Cleveland Clinic’s Digestive Disease Institute. If you think you notice the warning signs of arthritis or have been diagnosed, I have good news. Eating certain meals for breakfast can treat arthritis pain — all breakfast lovers rejoice! Breakfast is the most important meal of the day; it kick starts your body to function at its best for the rest of the day, so it’s only fitting that the best foods to fight arthritis can be eaten at good ol’ breakfast time. Everyone should strive to eat breakfast foods that are rich in arthritis-fighting nutrients, such as vitamin E, omega-3 fatty acids, copper, zinc and vitamin B6. Keep reading to find out what foods you need to eat for breakfast to manage arthritis! One of my favorite breakfast meals is a whole grain bagel topped with smoked salmon. Salmon is rich in omega-3 fatty acids, which studies have found can decrease inflammation. Doctors recommend eating a 3- to 6-ounce serving of salmon at least two to four times a week to lower inflammation. The omega-3 fatty acids in salmon can interfere with immune cells called leukocytes and enzymes known as cytokines, which are involved in the body’s inflammatory response. If salmon doesn’t agree with your taste buds at breakfast time, try taking fish oil supplements with your meal. Dietary supplements of fish oil can produce improvements in tender joints. This mild drink is high in nutrients and antioxidants. It contains polyphenols, a compound found in plants that has powerful anti-inflammatory effects on the body. A study in the Arthritis Research & Therapy journal found green tea to be effective when used to prevent and reduce inflammation. To reap the most benefits from green tea, be sure to use tea bags, not the powdered tea mixes, which tend to be more processed. Berries are the perfect sweet and light addition to any breakfast. Berries are high in antioxidants and fiber. Constipation can be a symptom of arthritis due to certain prescribed medications and the fiber found in berries can alleviate stubborn constipation. Studies show that even small amounts of berries eaten for breakfast can help fight inflammation and free radical oxidative damage. During the study by the Oklahoma Medical Research Foundation, results showed inflammation and cartilage degradation were significantly decreased in the participants who ate strawberries. Individuals also reported a reduction in constant, intermittent and total pain. The best berries to eat are strawberries, blueberries and red raspberries. These berries have been known to reduce symptoms and slow the progression of arthritis. Since fresh berries aren’t always readily available depending on the season, frozen berries can also be used. Frozen berries, particularly freeze-dried blueberries and strawberries, are also effective in improving arthritis-related symptoms in clinical studies. Orange and pineapple juices contain vitamin C. Because citrus juices are high in vitamin C, they have antioxidant properties, which can neutralize free radicals that lead to inflammation. Be sure to keep an eye on the amount of sugar, additives and calories in your citrus juice of choice. Freshly squeezed juice with no added sugar is always the healthiest and most sensible option. A handful of nuts can boost your body’s ability to combat stiff and aching joints. Nuts are a quick and easy addition to any breakfast meal. They are easily accessible, high in protein, low in saturated fats and contain little or no cholesterol. Skip out on calorie-ridden animal protein during breakfast and switch to nuts, which serve as a great replacement. Consuming a quarter-cup of nuts can increase your joint mobility. Plus, it’s a great source of fiber. When adding nuts to your breakfast, be sure to reach for the “no salt” nuts to keep from adding excessive sodium to your diet. Added sodium can have adverse effects on your joints and increase inflammation. Studies show eating a vegetarian breakfast with healthy whole grains can reduce arthritis symptoms. Whole grains are rich in antioxidants and protect cells from damage. Eating whole grains at breakfast time is associated with a lower risk of developing knee pain, which is linked to arthritis. Doctors recommend eating at least 25 grams of fiber per day to get rid of inflammation. Try adding whole wheat, barley, bulgur or quinoa in your breakfast for added nutrients and fiber. When buying whole grain products, double check the ingredients label to make sure the first ingredient is “whole grain” or “whole wheat” and not a blend of enriched white flour. Arthritis can be troublesome but eating these foods for breakfast can help you live life more comfortably. 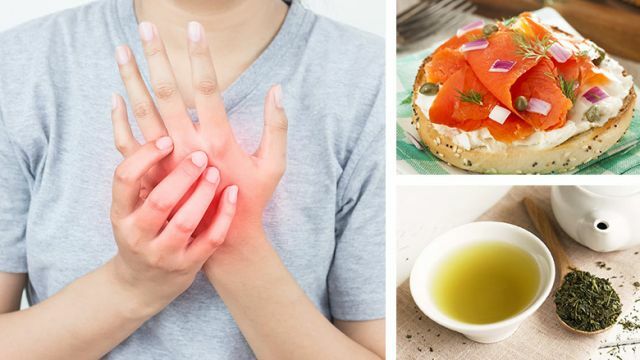 Which arthritis-fighting foods have you tried before? Leave your comments below. Hey Buddy!, I found this information for you: "If You Have Arthritis Pain, Eat These 6 Ingredients For Breakfast". Here is the website link: https://www.thealternativedaily.com/eat-these-6-breakfast-ingredients-for-arthritis-pain/. Thank you.